Paul B. Thompson holds the W. K. Kellogg Chair in Agricultural, Food and Community Ethics at Michigan State University in East Lansing, Michigan. He has published extensively on the environmental and social significance of agriculture. His 1992 book (with four coauthors) on U.S. agricultural policy, Sacred Cows and Hot Potatoes, was used as a textbook for U.S. Congressional agriculture staff. 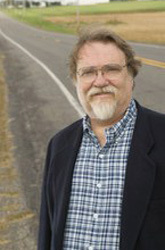 He is a two time recipient of the American Agricultural Economics Association Award for Excellence in Communication, and in 2010 he was a speaker at the Gustavus Adolphus College’s 46th Nobel Conference on “Making Food Good.” He has also published a number of volumes and papers on the philosophical and cultural significance of farming, notably The Spirit of the Soil: Agriculture and Environmental Ethics (1995) and The Agrarian Roots of Pragmatism (2000). A new book entitled The Agrarian Vision: Sustainability and Environmental Ethics was published by the University Press of Kentucky in July 2010. Thompson’s research in the philosophy of technology has also centered on ethical and philosophical questions associated with agriculture and food. Between 1986 and 2006 he undertook a well-received series of projects on the application of recombinant DNA techniques to agricultural crops and food animals. Thompson published the first book length philosophical treatment of agricultural biotechnology in 1997 with a second edition in 2007, and has traveled the world speaking on the subject, delivering invited addresses in Egypt, Thailand, Taiwan, Mexico, Israel and Jamaica, as well as a number of European countries. In addition to philosophical outlets, his work on biotechnology has appeared in technical journals including Plant Physiology, The Journal of Animal Science, Bioscience, Poultry Science andCahiers d’Economie et Sociologie Rurales. He served on the United States National Research Council’s Agricultural Biotechnology Advisory Council (2002-2005), the U.S. Department of Agriculture Agricultural Biotechnology Research Advisory Committee (1994-1996) and on the Science and Industry Advisory Committee for Genome Canada (2004-2008). Thompson’s new work on agricultural technoscience focuses on synthetic biology, biofuels and nanotechnology in the agrifood system. Before assuming his Chair at Michigan State in 2003, Thompson held positions in philosophy and agricultural science departments at Texas A&M University and Purdue University. Thompson completed his Ph.D. studies on the philosophy of technology at the State University of New York at Stony Brook under the guidance of Don Ihde. He is married, has two grown children and enjoys nature walks as well as playing the guitar. J. C. Swanson, Y. Lee, P. B. Thompson, R. Bawden and J. A. Mench, “Integration: Valuing Stakeholder Input in Setting Priorities for Socially Sustainable Egg Production,” Poultry Science90(2012): 2110-2121. P. B. Thompson, “Current Ethical Issues in Animal Biotechnology,” Reproduction, Fertility and Development, 20 (2008): 67–73.